Why does your firm need a website? An effective website is the cornerstone of your company. It acts as a portal so customers can learn more about your company, research your products and services, and determine if they want to do business with you. It’s the anchor for your marketing, a direct channel to your client base, and a necessity for establishing your firm’s credibility. Websites are one of the most cost-effective tools available to you. Your site may be the first chance you have at making a good impression with a prospective client. Some businesses find that establishing a presence on the Internet has proven to be a complicated and time-consuming task. Not with Benefit Insights. We have streamlined the process by providing you with a comprehensive bundle of services that will get you up and running quickly. Our fully responsive, modern websites are affordable, easy to implement, and flexible enough to continue to meet your needs as your business grows. 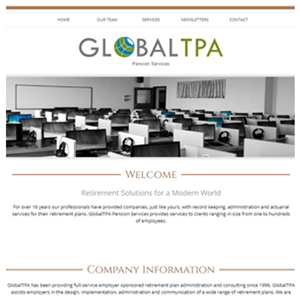 The greatest advantage to you is that our websites are designed and maintained by pension professionals who know your business. 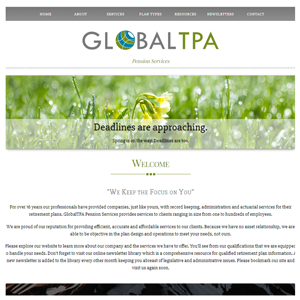 Unlike other web designers, we are not starting from scratch when developing your site and have made these designs with the TPA community in mind. We even include a Word file of sample language to help you get started with personalizing your pages. 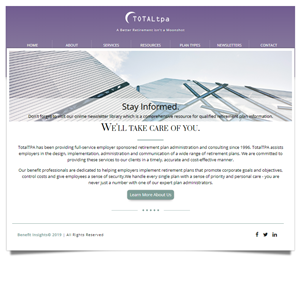 Description Your one-page site will act as an online brochure, describing your business and services as well as providing contact information for your firm. Your professional multi-page site is the portal to your company, connecting you to your clients and anchoring your marketing to new customers. Do you need a web presence but not a full-scale website? Our one-page sites are perfect for firms that are not yet ready to commit to the costs of a multi-page website but want an internet presence. Your one-page site will act as an online brochure, describing your business and services, as well as provide contact information for your firm, e.g., address, telephone number, fax number, email address to request additional information, etc. Your personalized banner incorporating your company name, logo, company slogan, etc. designed with the colors that you select. Your text and choice of accent colors that represent your company. Graphics such as your logo, photos, etc. integrated into our template.. Links to connect to your preferred social media platforms. We handle all the technical details involved in getting your materials ready for the internet and placing them online. Annual website hosting setup and maintenance. Freedom to upgrade to the premium multi-page site at any time. Ready for a full-scale professional site? 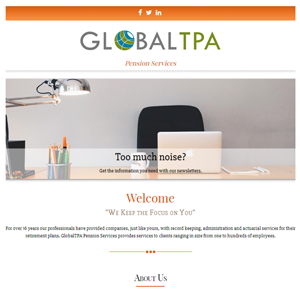 Our multi-page sites are perfect for firms ready to utilize their web presence as a fully functioning prospect and client hub. Your website will not only represent your firm to the outside world, but allow for better client service and an avenue for new business prospects to connect with you. 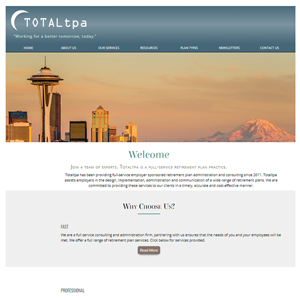 With a selection of TPA-focused, customizable templates to choose from, our sites will establish your company as an accessible and respectable presence in the retirement community. Your firm's domain name, e.g., www.yourfirmname.com. Graphics such as your logo, photos, etc. integrated into our template. Traffic tracking compatibility to enhance your marketing ability. Automatic annual plan limits update. Want to make an even bigger impact with your web presence? 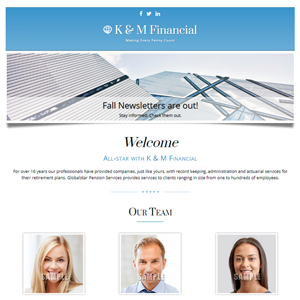 Combine your website service with our client-focused newsletter, Benefit Insights, and receive a 10% discount on all services. Administrative forms: beneficiary designation, participant enrollment, participant direction of investments, loan application, hardship application, distribution request and tax notice, etc. You simply provide your firm's form to us as a .pdf file. The charge to upload a form and link it to your website is $25 per form. 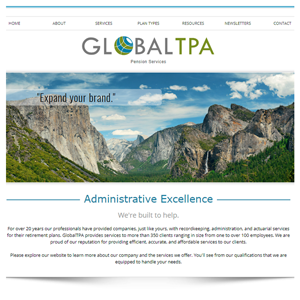 Set up costs for these customized pages will depend upon their complexity. Please contact us with your requirements and we will be happy to provide a quotation for setting up your additional pages. For a simple, text-only page such as a Frequently Asked Questions page, the cost is generally a one-time charge of $75 if included with the initial site set up. To keep the setup fee affordable, we offer several standard web page layouts from which to choose. If you are interested in having a website with a look other than our standard layout, we will be happy to assist in helping you build a site look that suits your needs.